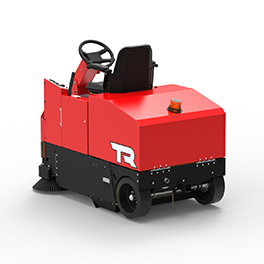 The Factory Cat model TR's design was built from the success of our Model 34 walk behind sweeper. 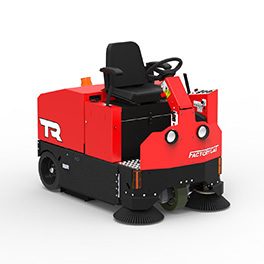 The TR's side brooms sweep up dirt in the corners while a huge tubular sweeping broom under the machine sweeps up the dirt and debris from the floor and packs it into the steel hopper. 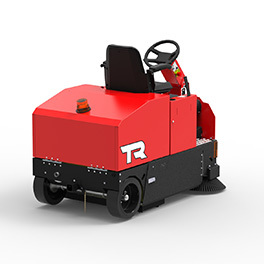 These machines are all-steel, and use oversized components throughout. At your in-plant inspection, you’ll see top quality componentry, hefty fabrications, oversized motors, and nearly 100% stainless steel fasteners. 46-inch Width - 60,568 sq. ft./hr. 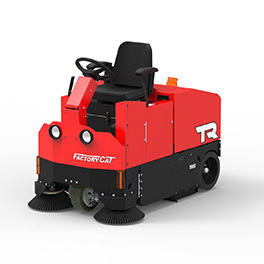 Factory Cat’s “Central Command” energy management system gives our silent, electric rider sweepers the power formerly available from only gasoline or propane-powered machines. Factory Cat machines are designed and built in the USA. Constructed of thick steel, use stainless fastners and powder painted to prevent corrosion. The tanks have extra-thick walls, brass inserts, and "through tubes" for strength. Factory Cat machines are overbuilt to last.